I just posted the Table of Contents for the September issue of ANS (Vol 35:3) on the web site! There will be 14 articles in this issue. All will be online; and about half will be in the paper volume. 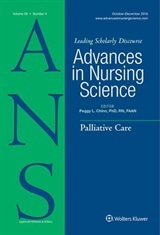 The concept of transitions has been a significant focus for nursing scholars for several decades. Afaf Meleis, who has been a member of the ANS advisory board for many years, was a leader in articulating a theory of transitions for nursing. Her work has provided a foundation for many of the scholars whose work appears in this issue of the journal. These articles provide a rich range of approaches to the conceptualization of this phenomenon in a variety of settings, with several different population groups, and with important implications for practice. Taken together, the articles provide a thought-provoking collection representing the best of nursing scholarship. Take a look at the titles that will be in this issue. Several of the articles will be published ahead of print, and available for download when they appear in the “Published Ahead of Print” section of the web site. And of course all of the articles will be available as soon as the publication date arrives – early in September 2012!